We’re excited to be working with a revolutionary piece of technology that will empower consumers to speak with brands in real-time, thus providing a truly engaging, ongoing experience. New York-based digital creative and advertising agency, Pomegranate, has signed on as digital agency of record for Engagement Media Technologies (EMT)—an enterprise brand structured to empower global, real-time communication between individuals and brands that is facilitated through mobile and Web. In this creative role, Pomegranate will build and manage EMT’s revolutionary new mobile app., StringFly™. StringFly™'s multi-faceted engagement components include three targeted areas, designed to reach specific markets: Engage.Me™, OneNews™ and Gevius™. 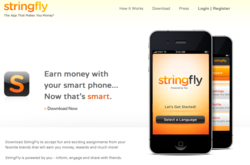 Through the use of StringFly™, consumers are able to stream and share photos and videos in real-time on all of the company's platforms—allowing brands, news outlets and numerous other organizations instantaneous access to an abundance of user generated data that can be used for research, marketing and much more. Pomegranate will build and strengthen EMT’s online presence through a variety of digital marketing strategies that will reinforce EMT’s brand, drive sales and app. downloads, and build awareness of their evolutionary milestone in social media. Founded in 2008, Pomegranate is a digital creative and advertising agency that leverages new media and technology to implement cutting-edge marketing campaigns that reshape the way brands engage and adapt to their audiences. Pomegranate's unique "network agency" model unites experienced marketers, creative directors, designers, engineers, and programmers within a streamlined organizational structure and value-assurance system. The team provides creative services including strategy and positioning; design and branding; marketing and advertising services such as SEO, interactive, e-mail marketing, and specialty Google / YouTube projects; and technology solutions such as the engage.me real-time social engagement platform, cloud hosting, ecommerce, and more. Satisfied clients include Google, YouTube, Bosch, Toyota, Scion, Kraft, Canon, Nestlé, and Rock & Republic. Engagement Media Technologies (EMT) is an enterprise brand structured to empower global, real-time communication between individuals and enterprises using proprietary digital and mobile technologies. EMT's mobile application, StringFly™, distributes a new level of engaging experiences allowing users to create relevant and meaningful content centered on an incentive-based, branded experience or sponsored assignment. StringFly™'s multi-faceted engagement components include three targeted areas: Engage.Me™, where consumers can connect directly with brand owners and advertisers; OneNews™, an interactive news portal for "citizen reporters" to upload text, photos and videos of breaking news as it happens; and Gevius™, an information hub designed to give organizations vital information from consumers when they need it the most – from product compliance to security – via user generated text, photos and video intelligence.